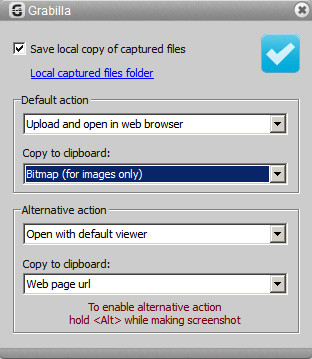 If you want to copy captured screenshot to clipboard as image, say for further pasting in graphics editing application, you can set this in configuration panel (presented in 1.15 version). Set Copy to clipboard parameter to Bitmap (for images only). Remember that this will work for images only, not for videos. You can upload edited images with Drag-and-Drop upload feature later. So download Grabilla now and enjoy simple and fast screen and video capturing and sharing.